Shelley Bean: Kids Just Want to Have Fun...coming soon! Hello everyone! 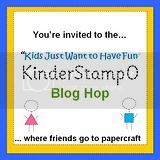 I wanted to remind everyone about the upcoming KinderStampo blog hop coming up this Saturday. Mark your calenders...it should be a lot of fun! The theme is kids' crafts and everyone will be sharing a crafting activity that is kid friendly. I am a part of the fun and will bring you a video with a special guest. :) I am looking forward to sharing the project with you all...so be sure to tune in. your comment tab is not there for te blog hop.